As I have been sent here to organize the development of sustainable water sanitation infrastructure, it dawned on me that knowing how to make things out of mud is essential to my very existence. It was a slightly disheartening concept to grasp as I was just getting reconnoitered with my new neighbors, for after the last torrential downpours of August many of the huts in the neighborhood had collapsed entirely. When I was meeting the kindergarten teacher Jirré whose house is in back of my garden I could not help but stare at his concession wall which had just fallen into rubble the night before. Though I possessed the Bambara vocabulary of maybe a slow 2-year-old, I thought it was a good occasion to offer a friendly neighborly hand. Jirré told me that there was no point in rebuilding the wall then when the rains still fell and there were still cereal crops to tend to. People in Sanadougou save their construction for dry season when agriculture has come to a standstill. Now that that time has come, Jirré and the other men in his concession started amassing mud bricks and I told him that I still wanted to help him rebuild the wall. He thought it was a funny idea. Despite my last name, I’ve never built a wall before and I know nothing about making walls. But the educational component of the Peace Corps goes both ways: I teach the people of my village how to treat their drinking water, they teach me how to survive in Mali. As my numerous trips to the medical bureau can attest, surviving in Mali is remarkably difficult and so I am grateful to my neighbors for teaching me how exactly it is that they do it. An essential part of learning how to survive in Mali is making use of mud. If there is anything I can do to create a sufficiently vivid imagery of my Malian village, think of mud huts. Dirt and water are mixed up into a formable consistency, mushed into the desired shape and left in the sun to harden. Many people have wooden molds which they use to form mud into uniform bricks which are dried for at least three days and then mortared together with wet mud to make walls which are then slathered with another smoother layer of mud. Only the very wealthiest people in society have tin roofs and cement floors, but except for logs as support beams and thatched roofs many people build their houses exclusively out of mud. Mud is the primary component of just about every house, latrine, stable, chicken coop, butigi, granary, mosque, even the Grand Mosque of Djenné – just about every structure not built by the State or a foreign NGO – which exists in the country of 11 million people which is Mali. Now that my Bambara skills have progressed significantly, the level of the conversation went up a few notches. It only went up a few notches though, because it has gotten to the point where I have had this conversation about a hundred times before. Other than just saying flat out “No, Peace Corps Volunteers are not sent out to site with a suitcase full of green cards… by the way, what’s your name again?” whenever I have to deny this request for the umpteenth time I try to be as polite as I can and make this into a learning experience about why my Malian friends want to flee their country. As I am mucking the tops of the bricks with a fresh layer of adhesive mud, I tried my best to explain that it is not as easy as that. In Bambara, one does not “earn money” or “gagne de l’argent”; E be wari soro – “you find money” in America, as in “I was walking in the woods and I found a four-leaf clover”. It’s not as though they have a business plan set up or even the slightest idea of what it is that people do in the industrialized West, it’s as simple as the fact that money is there – and they are going to find it. The best image which comes to mind would be the first English colonists who came to Virginia and and thought they could just start digging until they struck gold. I also think of the tens of thousands of Malians who descend upon Bamako especially in dry season to find themselves some money. There aren’t many factories even in the capital city, there is hardly any value added to the food products grown in the villages – there are really only middlemen. But people are buying things, currency is changing hands there, and it is thought that if you somehow stand in the middle of the flow of goods and get your hands on some of those goods and pass them from Point A to Point B that you might be able to skim enough from the top to eventually buy yourself an mp3 player. The number one job for men who migrate to the cities in search of work is to buy a 12-pack of phone cards for 11,700 francs and after standing in the middle of the road all day waving phone cards in pedestrians’ faces maybe if they're lucky they can hawk them all for 12,000 francs - a day's profit of 300 francs which is equivalent to about 60 cents. When women come from rural villages to the big city most likely they will end up finding money in the oldest profession: prostitution. A good number of fortune seekers realize that since there are phone card peddlers on each corner and the bars are of course full of hookers realize there is simply too much competition and so the only way to find money is to walk between cars in the congested crossroads and hold their hand out hoping that one of the middlemen will find some sympathy and toss them some small change. So when people tell me that they want to do in America, I ask them what exactly it is they want to do when they get there. I try my best to explain politely that no one farms millet in America because Americans like to eat corn and wheat and rice and barley and oats instead. Millet is an inferior good with so little nutritional value which is only grown in the West African Sahel because it is the only crop which can feed the exploding population with so little rainfall. What I don’t say is that you couldn’t pay people in America to eat toh with leaf sauce and that millet is only sold as birdseed. And in America you can’t just mosey on over to a fallow field and till it until the village accepts it as yours; unless you feel like homesteading in the Alaskan tundra, in order to farm in America you have to first buy your land – the Anglo concept of private ownership of land according to a titled deed is an alien concept amongst traditional farmers. When I am rebuilding a wall out of mud and mud bricks because it disintegrated last rainy season and my fellow masons tell me that they can simply go to America and find themselves some money in the construction business, I find myself at loss of words. In America, if a carpenter were to build a house which collapses in the rain then he could face millions of dollars in fines and litigation if not imprisonment. 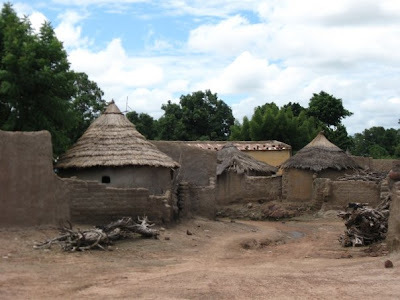 I am pretty sure that if one were to build a Malian mud hut in the United States, then housing authorities would prohibit anyone from living in it and would probably force them to tear it down. I have yet to find a way to explain the fact that there is absolutely zero demand in the American labor market for the millet farming and mud construction skills possessed by your average illiterate Malian who knows not a word of English without slaying hopes and dreams. So I simply tell the truth that they have to understand that America is not Heaven, that there are in fact many problems in my country. This is a hard concept to convey to a people whose only knowledge of the outside world comes from the state television station whose managers know very well that no one in Mali wants to sit down after a long day’s drudgery and learn about watch news broadcasts about poverty in America. "On TV there was a man from America and he owned many cars!" An even more difficult concept to convey is that the United States is currently suffering from an economic crisis, let alone to explain how exactly this crisis came about in the first place. “Well, due to a climate of low interest rates and predatory lending practices the real estate market was distorted by artificially-high prices…” Here in a traditional Malian village, you build your mud hut where your father built his mud hut and you sow the fields which have always been sowed by your family since time immemorial, and if your fields lie fallow then the dugutigi will grant them to someone else to make use of. The concept of holding a legal title to land simply does not exist. It is remarkably onerous trying to translate into Bambara that my mother earns her income by selling real estate, let alone what a mortgage is. If formal land ownership even existed in the world's third-poorest country and the banks could accept as collateral sandy farmland which only receives precipitation 7 months a year, the only mortgages which would exist would be subprime. The concepts of stock exchanges and investment banks and derivative markets, the basic ingredients of the modern crisis in capitalism are completely unexpressable in the language of a culture which is just beginning to develop private property ownership. So I try my best to bring it down a few levels and explain that the car factories are closing and there are already 12 million Americans who speak fluent English and have been to high school if not college and graduate school who cannot find any jobs (the population of Mali is 11 million), so maybe they should wait in Mali for a while and pick up some more skills before they try to make it big in America.